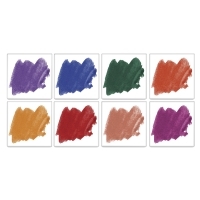 Use these fine-art decorating colors in watercolor pans for intricate, fine detail on figurines, dinnerware, etc. Intermix for tints and shading. Sets are packaged in plastic boxes with hinged lids. Fire to the temperature of the covering glaze. Pink, Maroon, Peach, Rose and Yellow hold their color when fired to temperatures up to Cone 6; All other colors may be fired up to Cone 10. 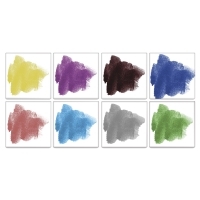 These underglazes work best with clear transparent glazes. 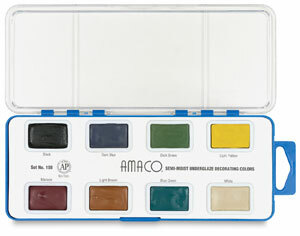 All colors are sprayable and dinnerware safe when applied and fired under Amaco LG-10 clear glaze. Set No. 111 — Includes eight whole pans: Electric Blue, Amethyst, Violet, Red, Light Red, Salmon, Real Orange, and Hunter Green. Set No. 108 — Includes eight whole pans: Maroon, Light Yellow, Blue-Green, Dark Blue, Black, Dark Green, Light Brown, White. Please note that Dark Blue appears lilac in color in the pan, but the underglaze fires to a deep blue. Set No. 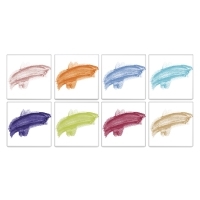 110 — Includes eight whole pans: Purple, Light Blue, Aqua, Rose, Orange, Peach, Chartreuse, and Sun Tan. Set No. 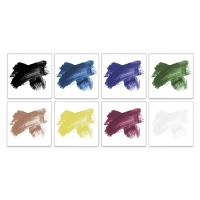 109 — Includes eight whole pans: Turquoise, Lilac, Medium Blue, Pink, Warm Gray, Mahogany Brown, Bright Yellow, and Irish Green. Amaco ceramic underglazes stay put where applied, even when fired. They offer controlled designs and come in a variety of formats; liquid, semi-moist, pastel stick and pencil. With underglaze, you can achieve a wide range of effects and detailed lines that you can't get with regular glazes.